Dona Tullis and Teresa Matteson were installed as new Urbana chapter of the Daughters of the American Revolution members in September. 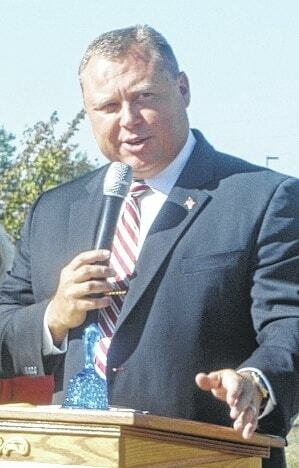 Champaign County Judge Brett Gilbert was the speaker for the DAR annual bell ringing ceremony at Freedom Grove to celebrate Constitution Week. On Sept. 17, the Urbana chapter of the Daughters of the American Revolution met at the Champaign County Community Center auditorium in Urbana for the annual Constitution Day Meeting, and for the Bell Ringing Ceremony at Freedom Grove. Members and guests present for the meeting were Urbana Chapter Members: Alexi Barker, Janet Blanton, Judy Brooks, Janice Coates, Margaret Denzer, Betty Driever, Jeanne Evans, Susan Fornof-Lippencott, Susan Gregg, Judith Henson, Alta Kay Holmes, Sharon McCall, Teresa Matteson, Peg Neiswander, Mary Pollock, Kay Schneider, Lana Seeberg, Becky Shultz, Kim Snyder, Carol Tong, Dona Tullis, Cheryl Walter and Dolly Wisma. State officers present were: Ohio State Organizing Secretary, Betsie Goad, Ohio State Registrar, Kathy Bentley, Ohio State Treasurer, Bellefontaine Chapter Member, and Associate Member Kathy Dixon, and our speaker Ohio State Chairman of Constitution Week, Sharon Snowden. Other chapter members present were: Lagonda Chapter Members Harmony Arendt, Leslie Arendt, Toni Holcomb (Associate Member), and Linda Katon (Associate Member) and Bellefontaine Chapter Member, Sara Telle. Guests present were: Audra Bean, Bill Bean, Linda Berube, Dennis Blanton, Debbie Heilman, Casey Matteson, Lillian Matteson, Cheryl Paxton, and Megan Snyder. Following a welcome, Regent Judi Henson listed September holidays and shared facts pertaining to The Constitution of the United States. A moment of silence was held for members who had recently lost loved ones. The meeting was called to order with the DAR ritual performed by Regent Henson, Chaplain Lana Seeberg, State Constitution Week Chairman Sharon Snowden and State Treasurer Kathy Dixon. 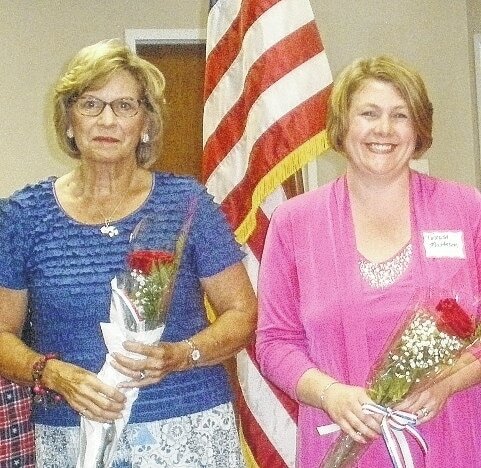 Teresa Matteson and Dona Tullis were installed as members of the Urbana Chapter Daughters of the American Revolution by State Registrar Kathy Bentley. A memorial service was observed by Margaret Denzer and Lana Seeberg for chapter member Patricia Martin Freund. Patricia was a faithful member of the Urbana Chapter DAR for 29 years. The President General’s Message observing the 125th anniversary of the National Society Daughters of the American Revolution was given by Peg Neiswander. Margaret Denzer presented the National Defense Report from the National Defender. Becky Shultz presented a virtual tour of Washington, DC and of the annual Continental Congress. Ohio State Constitution Week Chairman, Sharon Snowden spoke about our Constitution giving several interesting and little known facts. Those present participated in a fun spirited quiz on the U.S. Constitution. The business meeting resumed with the chaplain’s report given by Lana Seeberg. The secretary’s report was approved as written. The treasurer’s report was given and will be filed for audit. The Registrar’s Report was given by Betty Driever. The Urbana Chapter currently has 78 members with 11 associate members. The registrar is working with 3 prospective members. Historian Janet Ebert spoke at the St. Paris Antique Study Club on Wednesday, September 9. Regent Henson reminded members of the importance of the DAR websites. In the September issue of the Ohio DAR Newsletter an article submitted by Becky Shultz on the prestigious award, The Medal of Appreciation presented by the Sons of the American Revolution given to Betty Driever was featured. Colonel Robert Pollock was instrumental in securing this award. Application forms are currently available for members wishing to attend the Continental Congress on June 13-19, 2016. Committee Reports were given by American Indian Chairman, Carol Tong, DAR Service for Veterans Chairman, Mary Pollock, and Flag of the United States Chairman, Dolly Wisma. Members were also reminded to submit their forms and/or send their volunteer hours to Zara Liskowiak. Volunteer Information Specialist Chairman, Kim Snyder advised members how to register for the Kroger Community Awards program. Whetstone Chapter DAR 60th Anniversary Luncheon on Friday, November 6, 2015, at the Brookside Golf and Country Club. Historical Society. The program for the meeting will be “Daddy Was a Confederate” presented by Springfield Lagonda Chapter Member Leslie Arendt. Hostesses for the meeting were Janice Coates, Kay Schneider, Susan Gregg, Sharon McCall and Cate Brinnon. Following the meeting, members and guests participated in the traditional Constitution Day Celebration and Bell Ringing Ceremony at Freedom Grove. Submitted by the Urbana chapter of the Daughters of the American Revolution.